Good Morning! 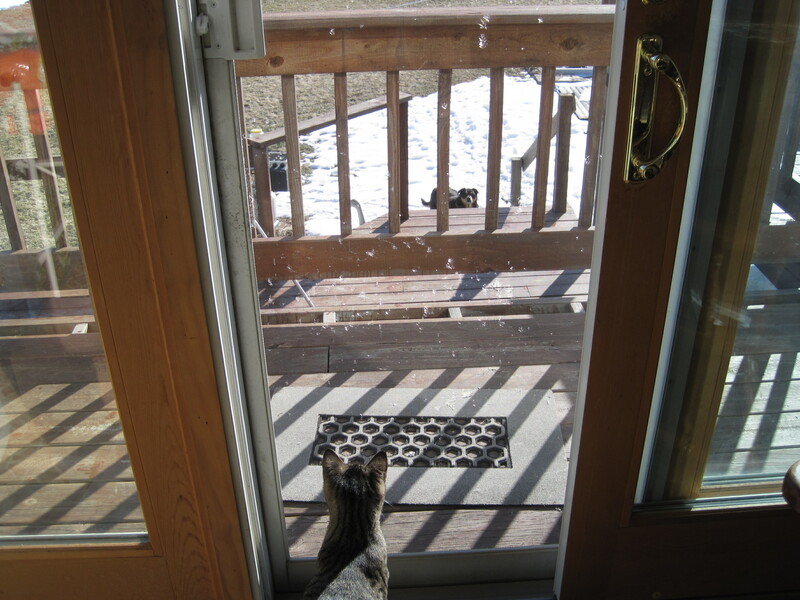 First picture: just before Uriah went outside we had an early morning visitor. This picture was taken off the video I shot through the window. 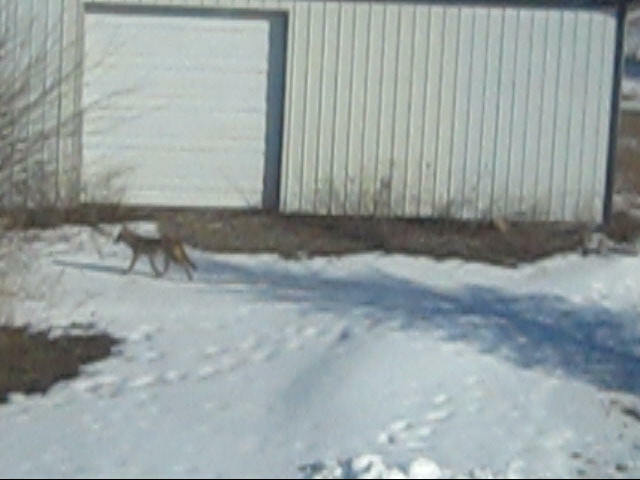 A bit blurry, but the coyote didn’t want to stand still. He was hunting. The second was taken when I opened the kitchen door to check on Uriah. Notice the screen has seen some better days. 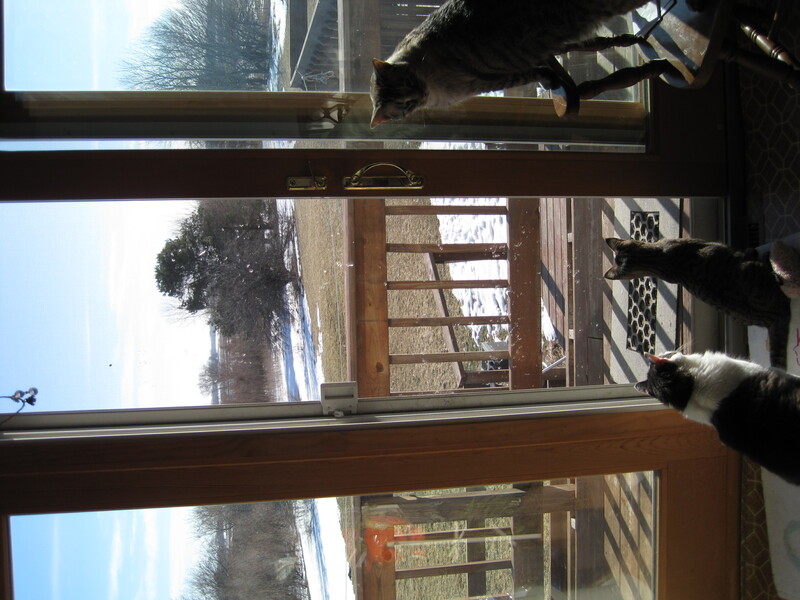 The cats heard Uriah moving around outside. I find this very weird; if you look closely at the second and third picture you can see a reflection in the window, and orange spot. 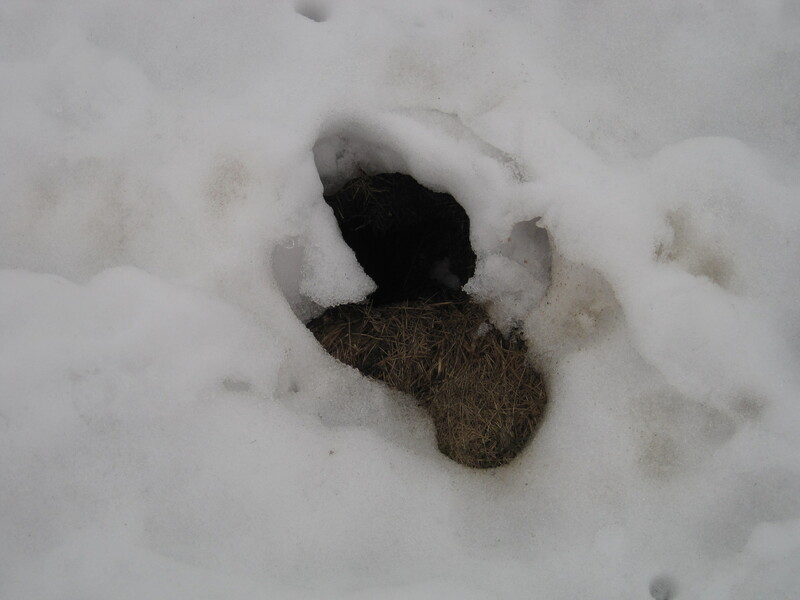 It is an orange bag of Iams cat food- what does it look like to you? The third picture, the only cat that was interested in Uriah was Sano. The other two were irritated he scared off the birds. They didn’t stick around to watch him; they headed to a different window. In the fourth picture, I was ready to download pictures when Sano decided Uriah was worth talking to. I wonder what they are saying to each other? I took it twice. The first time My sickness Quotient was 68%- I was insulted so I took it again and told the truth. Ahhh! 99% much better!! WARNING: Your Sickness Quotient of 99% is very disturbing. Here’s the link have fun. Yesterday, the temperatures rose high enough that the snow became heavy and started to thaw, just enough to become slippery and wet. Twenty-four hours later, today. The snow was solid and slick with chucks of sharp ice. 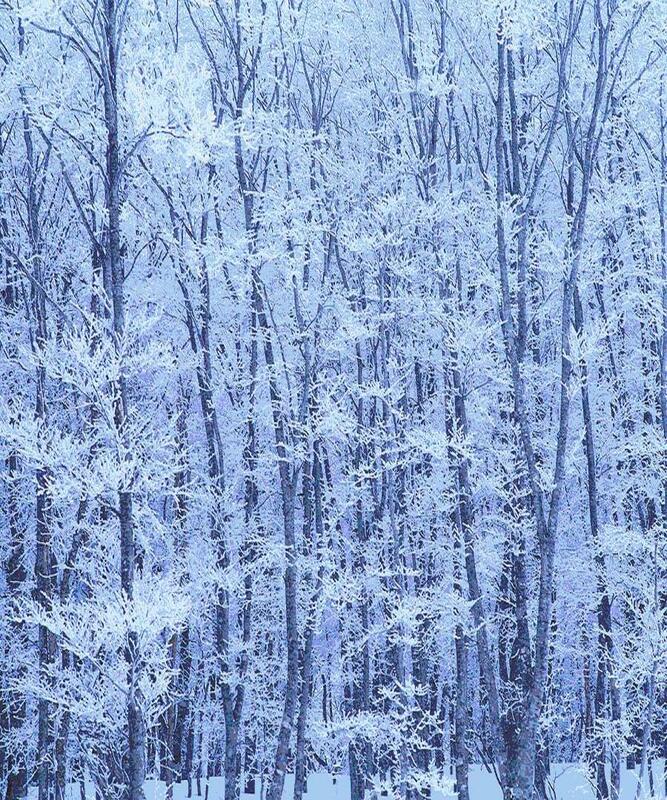 The snow was so hard Uriah’s paws slid as he walked across the top without breaking through. Instead he slipped and fell. He was not amused! 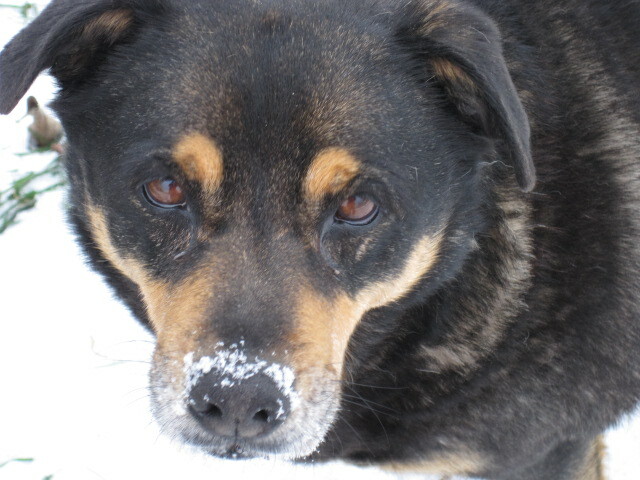 I tromped over to him, allowing my weight to break the top layer of snow. I moved slowly to where Uriah sat. He looked irritated at the smooth, white snow stretching out in front of him. Stabbing my ski poles into the snow on either side of Uriah, I tried to slide him off the top of the snow bank, onto the area I packed down. When he was back on his feet/paws, Uriah glanced back at the tree he had been heading for, for a second he hesitated, sighed and made an odd grumbling, growling sound. If Uriah had fingers I bet he would have flipped the bird at that snow bank. Uriah made a half hearted attempt to walk behind me, then he decided to walk next to me, on that snow covered frozen path. As we walked the sky cleared and a deep, purplish blue sat on the horizon to the east. I stopped and looked straight up. The sky was slightly hazy grey. Some low clouds moved above me, giving me a closed in feeling. The air held an odor of pond water, fishy and green smelling. As I headed along the path a sweet, bitter smell of smoke curled around me until I reached the far back. At that point, the path turns to the north and rounds out and heads back west, towards the house. Just then, the wind picked up blowing in from the north-east, and pushed away the burning campfire smell. The air changed, I could smell cows, manure and hay. As far as I could see, the snow covered the fields. A pattern of colors and lines weaved in and out. 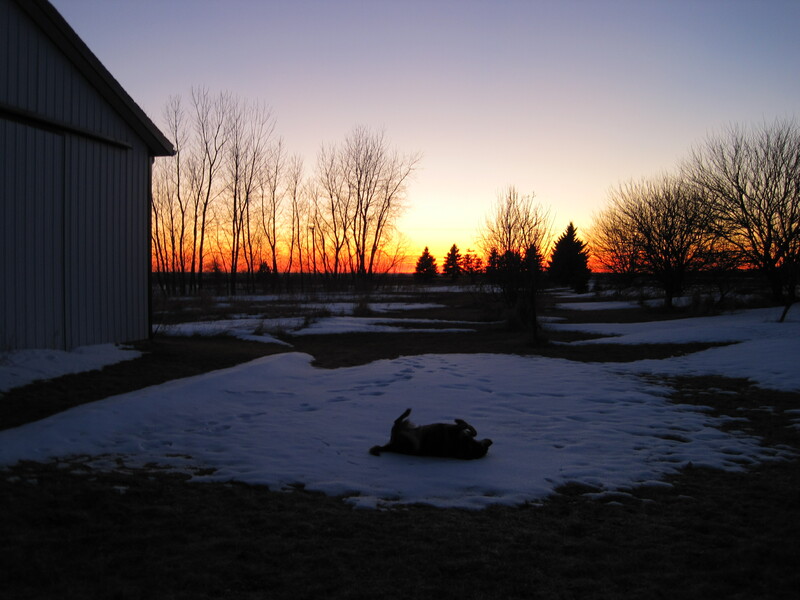 I looked towards the farmer’s barn; I could see cows walking slowly and dark earth pushing up between snow drifts. Grey ice covered the lower areas, frosted and untouched by the slightly warmer air. Uriah and I reached some heavy bushes; we walked underneath them instead of around. A tiny, black headed bird, complained at our intrusion. Uriah nudged my pocket I stopped and broke a milk bone in half and handed it to him. He was happily crunching away when a stick snapped next to us, we both turned to the right. Not more than a foot away from us was that Pheasant! His neck was stretched up high. Light grey with a dark blackish blue ring around his neck. He looked startled and scared, and he slowly backed away from us, then turned and flew into the taller trees. He missed the first branch and then started running towards the Bog Willows. He ran into a tree trunk flapping and scooting around until he disappeared into the trees. Picture a very stupid cartoon bird! Uriah looked at me. I shrugged and he made a half hearted move to chase the bird. He took a couple of steps, then changed his mind and continued eating his biscuit. Winter around here won’t end until April, if we are lucky. Uriah was very happy; he raced around me and kept looking at my pockets. I nearly tripped over him. He acted like I was playing and tried to race around me that lasted a whole minute. He is getting older. Uriah sat down to watch me. I blinked and tried to clear my eyes. It didn’t work. I gave up and shielded my eyes with my hand, and slowly walked into a snow drift. Snow poured over the top of my boots. I dusted it away and kept walking. Just as I reached the path, Uriah raced off into the trees. First I heard the deep squawking, and then I watched that elusive Pheasant fly awkwardly between the trees. No camera, again! Heavy Sigh! Later that afternoon we headed out again, this time I remembered the camera. The clouds had cleared, and the sky was a Cornflower blue. Instead of going around to the back, I wanted to see the pond in front. I believe it was January we had a thaw that inundated the land with water. 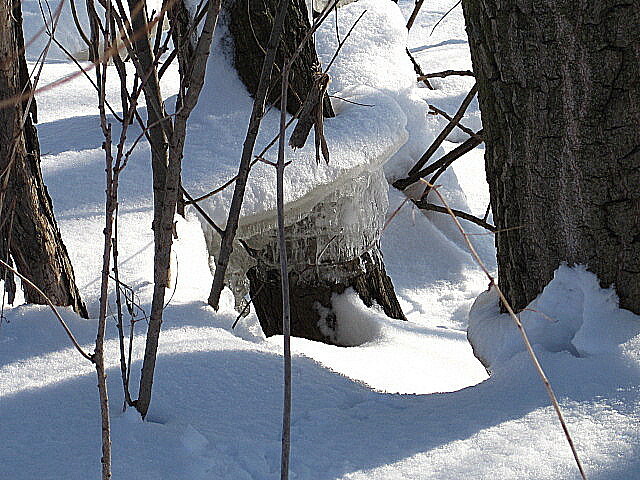 During the past few weeks the water has evaporated and left ice connected to tree trunks, similar to a picnic table on top and Stalactites forming underneath. 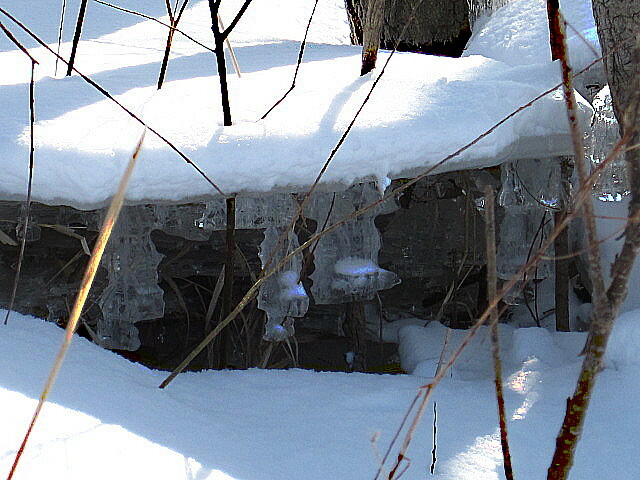 I carefully stepped into the deep snow surrounding the pond, and felt the ice give way under my boots. I eased as close as I could to the ponds edge, trying to judge where I thought that edge should be. Stupid? Yes I am! I didn’t get that close. Besides I was wearing my normal walking garb, a bright orange coat, grey knit hat, while dragging around ski poles. Almost forgot to add, I didn’t have on my normal blue jeans. So the people passing on the road, there weren’t a lot of cars, saw me wearing my flannel bright green PJs, with a design of coffee cups and candy pieces. I looked fabulous! Just like an escapee from psych ward. Last night the snow started. I stood outside under driveway light and watched the misty rain change to snow as it fell. The blacktop was coated within minutes, a slippery mess only Uriah hazarded to walk across. The air was filled with dampness, and fog from the frozen ground and warmer air. 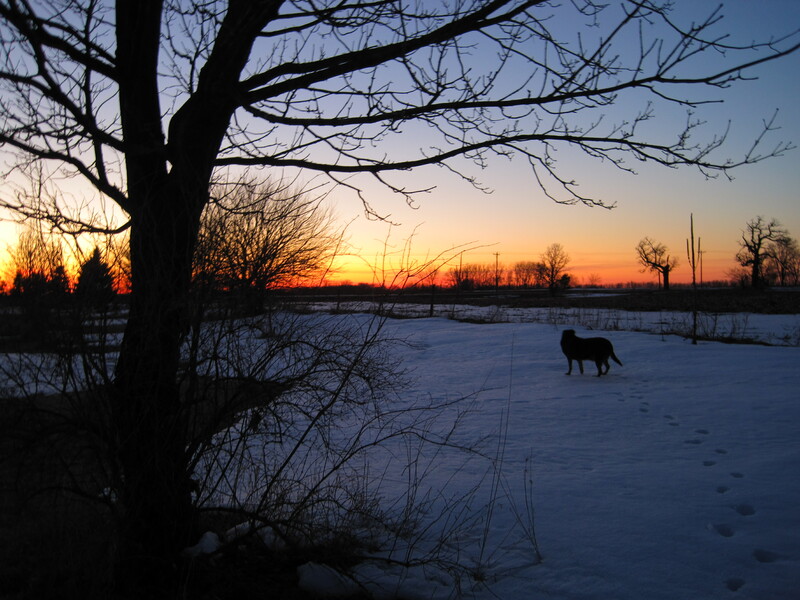 Even with the heavy darkness blanketing the house, sound wasn’t muffled and I could hear the coyotes racing across the farm fields, closing in on us. “Uriah, hurry up and pee! We have to get inside!” I held tightly to my ski poles and tried to peer into the darkness. Uriah moved slowly, his arthritis was acting up with the dampness. Still, his hackles rose when we heard the howling start. He puffed his chest out and scraped at the ground with his back legs. This morning, everything was covered in bridal white. Heart attack snow covered the driveway and deck. It’s the snow that one small shovel full can make a weight lifter grunt. The snow thrower will have a hard time with this mess. Underneath was a grey slush, which will strain both me and the snow thrower. I walked down the drive to the road, where the snow plow had sprayed extra snow on the mouth of the driveway. I kicked at it and decided we are snowed in till spring. 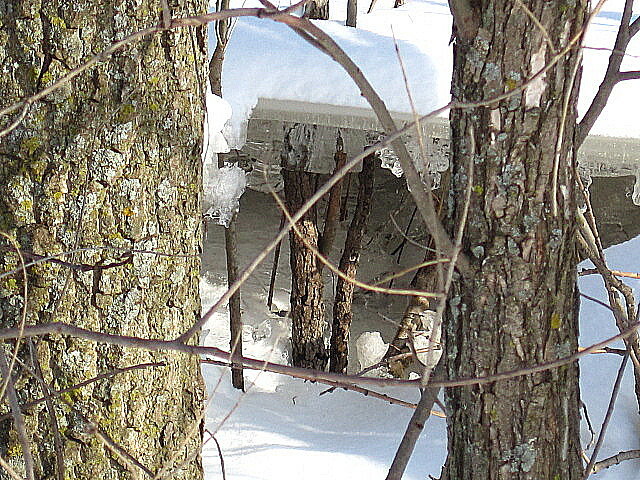 The deck had about four to six inches of snow waiting to melt into the outside kennel. Uriah and I checked it out. I was able to kick around a four by four foot patch so it didn’t drip on Uriah’s head. The rest will be a waterfall if the temperatures keep rising, which according to the weatherman, the warm-up isn’t here, yet. I received this award from (so far) Seven unique individuals and I send my heartfelt appreciation to each and every one of them. THANK YOU SO MUCH! This is an honor to be nominated! I am doing something different. 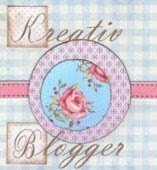 I am checking out new Blogs- Here they are. I have read their words and I love what I saw. 1 http://www.voxpoetica.com/Home.php This site is full of opportunities. I didn’t see a place to comment so if you follow this link, and you add your voice let them know how you found them. 6. http://newnatalie.blogspot.com/ Photos, art work and words. 10. http://bnhwelch.blogspot.com/ When I saw the picture of the peach tree in bloom I had to stop and read. 12. http://rainsgallery.blogspot.com/ Her paintings, I don’t see where to comment. I stuck my head out the door and instantly decided to stay inside until spring. That didn’t go over well with Uriah, or Kenshin. 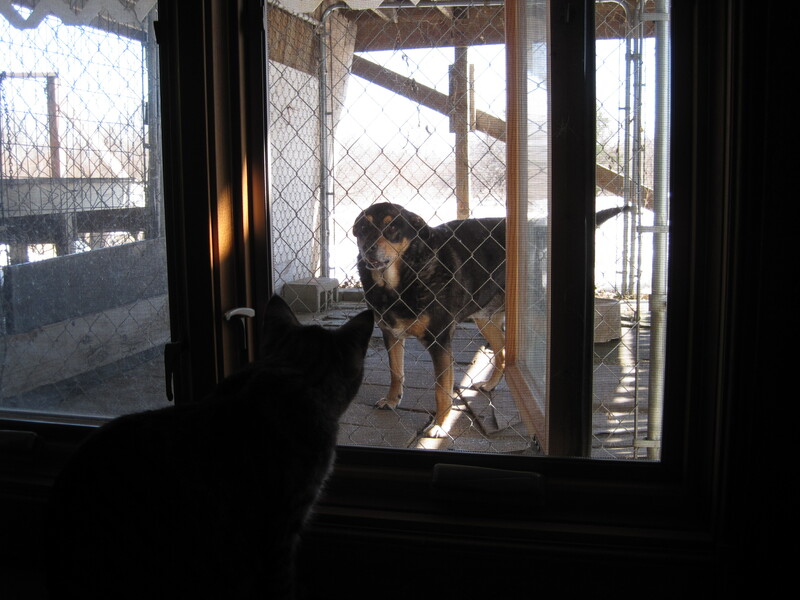 Both the dog and cat wanted outside. 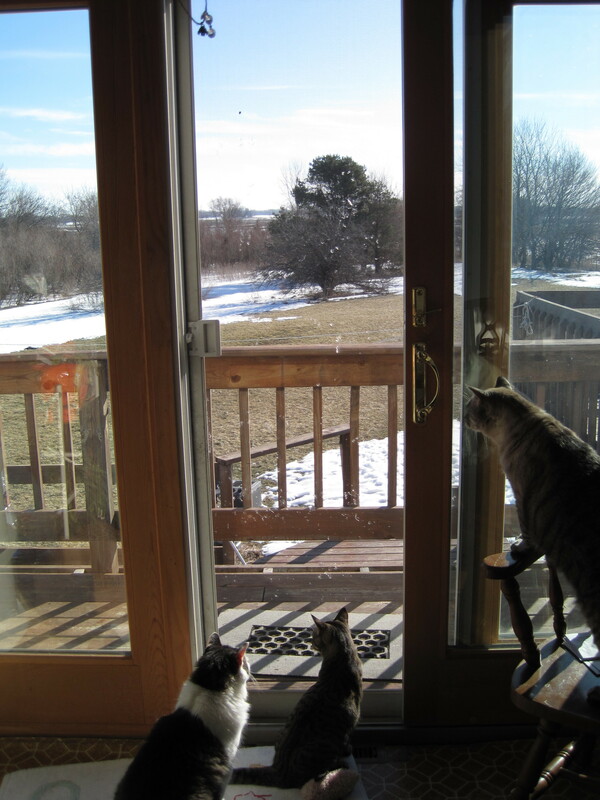 Uriah for bathroom duty and Kenshin had a wild look in his eye; he wanted me to walk him around on the deck so he could sniff the air. ”Nope!” I shook my head at Kenshin, who is an indoor cat. He frowned and decided to look out the window. Uriah happily wiggled out the door. I pulled on my coat, hat, and gloves. Grabbed my ski poles and reluctantly I stepped outside. Every thing was coated in black ice, the type that looks like wet pavement, but really isn’t. Uriah was slipping around the driveway following a scent. 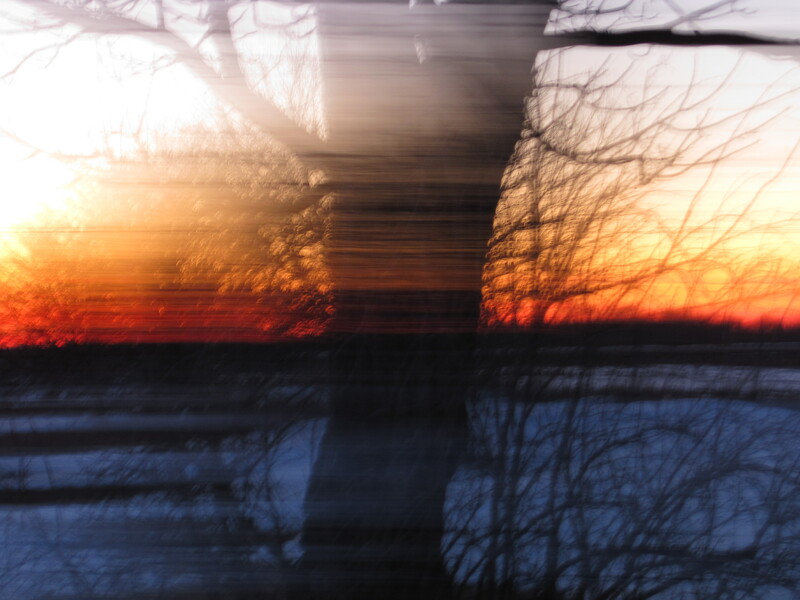 I leaned against the garage doors and listened to the winds howling through the trees. The deck boards creaked and the rain gutters rattled. Sharp ice started raining from the dreary grey sky. 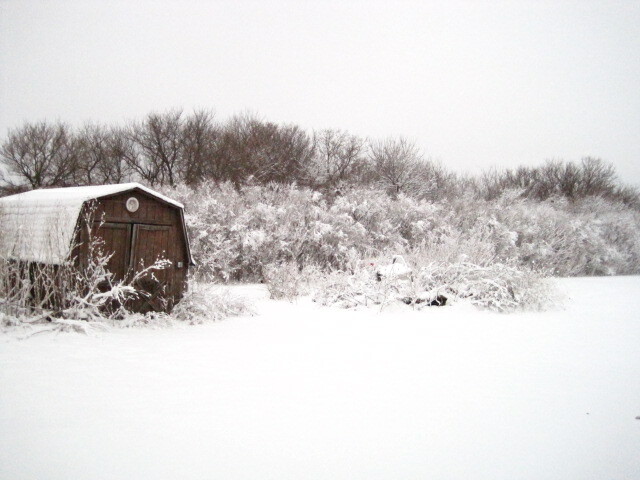 The snow, no longer pure white, had sunken in as the temperatures hovered just above freezing. The warmer air held a hint of a damp spring. In random areas I could see field grass attempting to show through the snow. Uriah stood about fifty feet away from me, just watching and waiting, willing me to follow. I muttered. “You win!” and took baby steps into the snowy yard. I walked a short distance up and onto a snowdrift, and then I started having trouble keeping on my feet. My non skid boots weren’t connecting to the snow and ice. Instead of standing still, I was slowly sliding backwards. I had one of two choices. Keep my ski poles stuck in the snow and end up on my face. Or, let go and hope I would glide backwards without falling. All the while I made this high pitch screeching sound, sort of like a sick coyote, until I came to a stop. Uriah thought I was playing and ran at me. As soon as he hit the black top, he slipped and landed on his backside. He coasted the rest of the way on his hind quarters stopping only when he bumped into my legs. If he hadn’t run into my legs, he would have just swept right past me and ended up in the snow under the Blue Spruce. Immediately Uriah scrambled to his paws and started pulling at the cuffs of my pants. To keep myself upright, I sat down. He answered me by grabbing my right glove, which I was waving at him, and pulled it off. He ran onto the snow, where he promptly started digging furiously. He looked up and gave me a doggy grin, and continued to dig. Once the hole was large enough, or so he thought. He dropped my glove in and pushed the snow over it using his nose. He took that as words of endearment. And ran back to me and grabbed my left glove and took off towards the pond. I slowly crawled and shuffled back into the house. I watched Uriah out the front window. He was digging like an insane dog. I’ll worry about them later. Right now, I have a cup of coffee and a book, Heat Wave by Richard Castle. I just need to find my reading glasses! 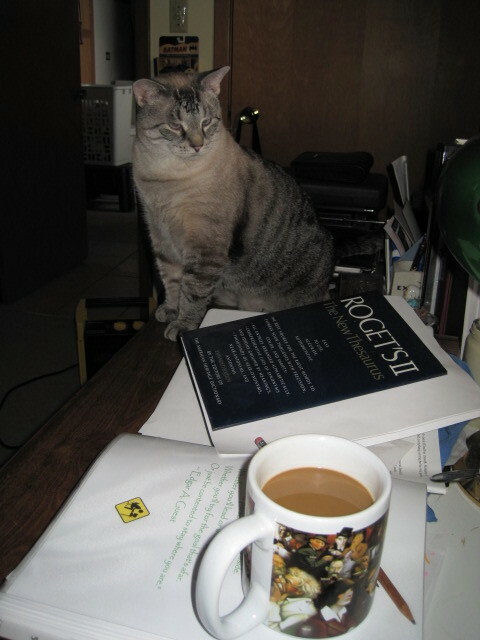 Tomoe, my husband’s cat loves to hide them, usually under the bed, or on the couch, or in the liter box…! Sigh! I have to apology to everyone for not setting up this post earlier; I have been a bit under the weather. 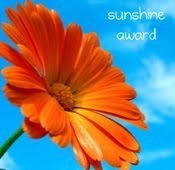 I have been nominated for a Blogger award from Lily, and from William! I have only had my Blog up since November; this is an honor for me. I really appricate everyone who has come to read, My Walking Path, and have followed the quick look into my day! 1.Thank the person giving you this award. 4.Name 7 things people don’t know about you. 6.Place a link to those Bloggers. 2. I was born with Hashimoto’s disease, which is a thyroid disorder. 3. I can’t take pain medicines; I have trouble even taking cold medicines. I am pro- medical marijuana – Bill hasn’t passed in Illinois. 4. When some tells me I can’t do something I go out of my way to prove them wrong. 5. I have a back injury that won’t allow me to sit more than ten to fifteen minutes at a time. 7. I hate to dye my hair, or wear makeup. Blogs I nominate are- I guess I can choose 14 since I had two nominations. 1. http://47whitebuffalo.wordpress.com/ a beautiful site to slip back in time with American Indians. Sad and insightful! 4. http://theonestopthoughtshop.wordpress.com/ Kristi a writer! A mom, daughter soon to be wife! 7. http://www.shelterangelspitbullrescue.org/index.php?p=home this one is brand new, Rebecca helps save pit bulls and she is my daughter. 8 http://rantourage.wordpress.com/ His pictures are wonderful great sense of humor! 10. http://pandabox33.wordpress.com/ Some posts in French some in English, love her thought process. 11. http://forbidden-planet.ca/ A wonderful Father, son and husband! Great pictures and thoughts. 12. http://curiosityquotient.blogspot.com/ beautiful pictures with their history added. Ideas, thoughts and just life. 13. http://clgphotos.wordpress.com/ These Photos are breath taking. 14. http://www.asiantrains.net/ This Blog feels like I am taking a train trip without the hassle.